We’ve all seen many of the latest and greatest fads come and go because the user interface is impossible to use and understand but with GPS car trackers ease of use is the key to their success. GPS car trackers are flexible and allow you to take advantage of their multitude of features all from whatever computing device you are most comfortable using (PC, tablet or smart mobile phone using Microsoft Windows, Android or Apple systems). Mobile devices let us keep track of important activities from anywhere in the world and now GPS car trackers have mobile applications that allow you to take advantage of all the features car trackers have to offer all from the convenience of your mobile device. For example, a simple SMS text like “MAP” can be sent to a fleetminder GPS car tracker from your mobile phone which result in the device sending back a link which shows the car’s location on your mobile phone map app (e.g. Google Maps). Many other SMS text commands can be sent to a GPS car tracker to provide other information and actions, such as triggering an output to set off the car alarm, to remotely lock the vehicle doors, or to set pre-defined areas where the vehicle may be parked, with automatic alerts if the car is moved, for example. Other commands such as an alternative alert contact can also be set, for example – you and your partner would both get an alert, just case you are not able to respond to a possible theft, your partner can. To summarise… essentially you can set your GPS car tracker to contact you automatically if your vehicle is moved and you can at anytime find it’s location and activate security features (provided the tracker is wired to those security systems within your vehicle). 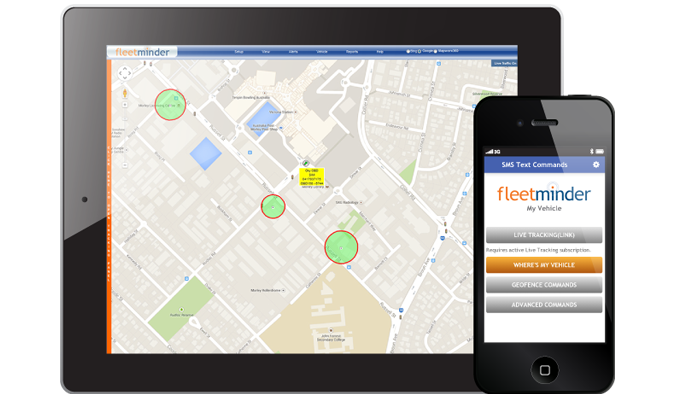 Now you can stay mobile while tracking each vehicle you own from the convenience of your mobile device and simple applications.